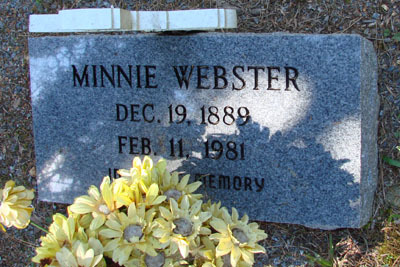 Minnie Lee Webster, daughter of Dennis Webster and Vianna Abernathy. Miss Minnie L. Webster, 92, Acworth, Route 1, died Wednesday. Survivors are one daughter, Mrs. Odessa Moss, Lindale; one sister, Mrs. Cammie Cantrell, Marietta; one brother, Virgil Webster, Acworth; six grandchildren; nieces and nephews. Funeral is Saturday at New Hope Baptist Church, Acworth with the Rev. Herschel Caldwell officiating. 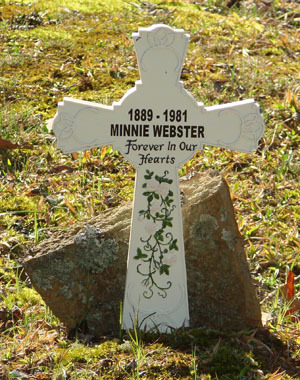 Interment will be in the Old Macedonia Cemetery, Cartersville. She is buried beside her mother Vianna. She was born in the Stamp Creek/Fairplay area of Bartow and Cherokee.